Looking back through my old Christmas letters I've sent over the years, I've noticed a theme....chaos, craziness, lots of love and the obligatory Christmas tree falling. And because I am a nut about tradition, today the Christmas tree fell. Complete chaos. That is the description of my house and my mind. I have never really been a very organized person or what you would call a planner, but this year feels more intense. Time is moving faster. Is it the recession? Is it too much coffee? Is it being over committed with holiday activities? Is it the pressure to have everything perfect? It could be the hormones. 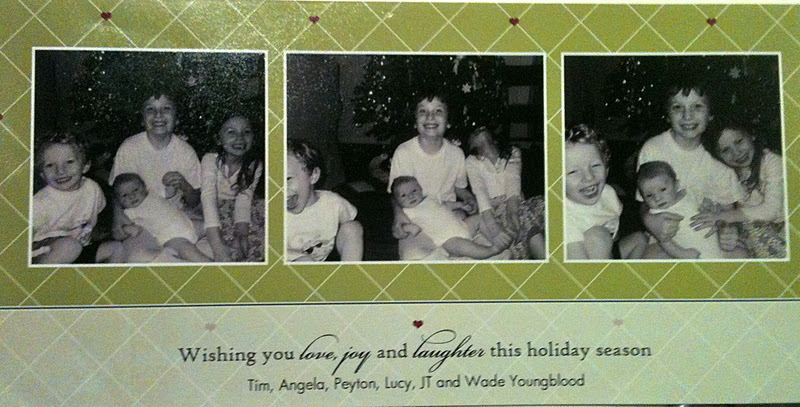 Happily, we had our fourth child in October, Wade Kimball Youngblood, and life hasn’t been the same since. He is a beautiful, healthy baby and we feel so lucky. But it has also rocked our world a bit. I am fine with change…as long as I am campaigning for it or in charge of it. Four kids, swine flu, holidays and breastfeeding…not so much. When we told people we were having another baby many people supported us. But others didn’t know what to say, remember this was right around the time Octomom became famous. People said “you are crazy,” “better you than me,” “how are you going to fit everybody in your house” and we even got a “why.” And yes, sometimes that was Tim and I talking to each other. It is impossible not to feel hopeful about life with these adorable, albeit violent, children in our lives. Lucy told us the other day she believes the world needs more bubbles…I agree. So, as we prepare for another Christmas pageant I do realize the chaos will calm down, the hormones will level out and life will be normal crazy. I also realize that we have become that family that takes up half the roles in the pageant. But I am proud to be that family. Wishing you and your family a very merry Christmas!!!!!! Thank god the kids from West Beverly were saved with a Christmas miracle. Love this Christmas special and the CD was a staple in my house growing up. I remember always wanting "a fast talking lover" when I was a fancy, sophisticated grown up (yup like Dolly Parton). "Dolly always says where there's a will, there's a way." Definitely a Christmas to remember! I completely heart Dolly then and now. There's nothing like soap operas at Christmas....so sad there are only a few left on the air. Long live the soaps! Long live the montage!